In its effort to defend life at all stages, the Pontifical Academy for Life is relying on young scientists and professionals to reach across the aisle and bridge the gap between science and faith, as Crux: Covering all things Catholic reports. 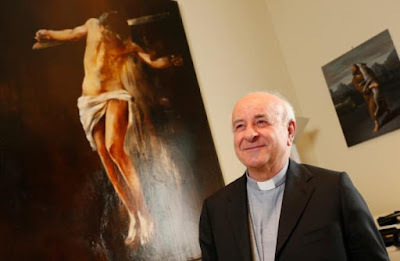 Archbishop Vincenzo Paglia, president of the Pontifical Academy for Life, is pictured after an interview in his office at the Vatican April 17. Since 2017, the pontifical academy has relied on the presence of young researchers to expand on this bioethical vision and give a fresh face to a timeless message. “There is nothing specific about what we are doing that’s different from the activity of other members. It’s just new blood in the academy to refresh its energy,” Sandra Azab told Catholic News Service June 26. “I think this conference is bringing many answers to the ailing questions that we are facing during our research, and especially with all the political events happening all over the world with immigration, inequality of health care access, etc.,” said Azab, who studied as a pharmacist in Egypt and works as an international health specialist.